California Rim Fire Was Started By Hunter's 'Illegal' Fire : The Two-Way At its peak, the Rim Fire threatened San Francisco's water supply and Yosemite's ancient sequoias. 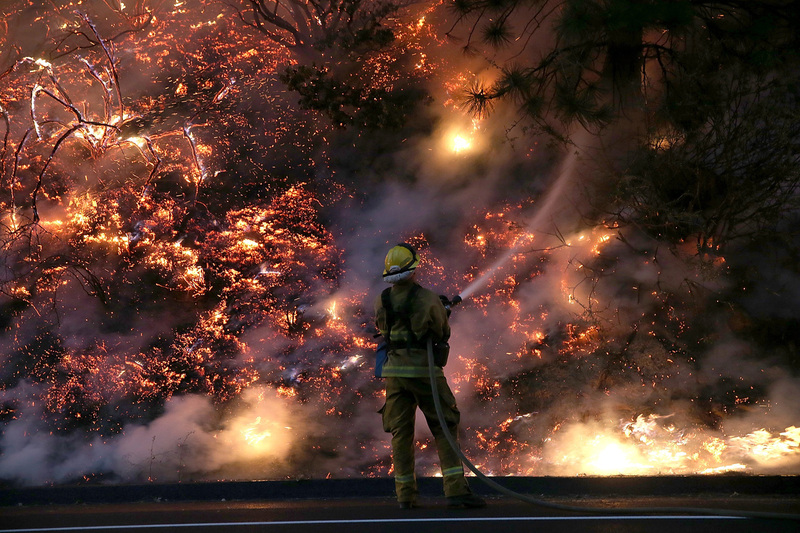 A firefighter uses a hose to douse the flames of the Rim Fire on Saturday near Groveland, California. The wildfire still burning north of Yosemite National Park — you know, the one that has charred 237,341 acres and was at one point one of the largest fires in recent California history — was started by a hunter's illegal fire. The U.S. Forest Service said in a statement that its investigators had concluded that the Rim Fire "began when a hunter allowed an illegal fire to escape." Authorities, said the Forest Service, have made no arrest and they are not releasing the name of the hunter. The Service also put to rest a rumor that had swirled for days. "There is no indication the hunter was involved with illegal marijuana cultivation on public lands and no marijuana cultivation sites were located near the origin of the fire," the Service said. "The rumor that marijuana growers may have been involved began when Twain Harte Fire and Rescue Chief Todd McNeal told a community meeting that the blaze was definitely human-caused. "On Aug. 23, McNeal said the fire started in a section of the Stanislaus National Forest that is inaccessible by foot or vehicle and that it was 'highly suspected' that an illegal 'marijuana-grow type of thing' had somehow sparked the blaze." At its peak, the Rim Fire threatened San Francisco's water supply and Yosemite's ancient sequoias. The fire could be seen from space and helicopter images were stunning.